Napoli are seriously considering Claudio Bravo as their next number one, with Pepe Reina looking set to join AC Milan in the summer. A source close to Bravo recently told Chilean outlet La Cuarta that Napoli and Paris Saint-Germain retain an interest in the 34-year-old. 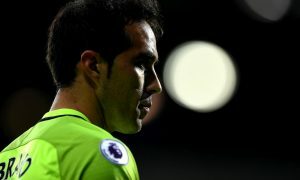 And according to Naples-based Radio CRC, it is true that the Serie A side are still thinking about 34-year-old Bravo, particularly when their other target from last summer, Gerónimo Rulli (who City also have one more chance to use a buy-back clause on this summer), hasn’t been in good form for Real Sociedad. The problem for Napoli, Raffaele Auriemma said on the radio channel, is Bravo’s high salary. Often an issue when Manchester City sell players abroad, Bravo earns a considerable amount and a compromise would have to be found were he to swap Manchester for Naples. The Chile international has yet to show any real signs that he wants to quit Manchester City, despite falling down the pecking order and only playing in cup competitions this season, but the chance to be a number one for a club in a prominent league could tempt him to move away.